New York Governor Andrew Cuomo visits Boreas Ponds in the Adirondacks which is among 69,000 acres that were acquired by the state. (I obtained this image via Google). The state paid $14.5 million for the tract, according to a deed filed April 5 in the Essex County clerk’s office. The state has yet to announce the sale, and the state Department of Environmental Conservation refused to answer questions about how public access will be managed. In the past, DEC has suggested that the public will be allowed to drive to within a mile or so of the ponds via a dirt road. A source told the Almanack that the road to the ponds is gated (and probably will remain so for the duration of mud season) and that the ponds are still frozen. The Nature Conservancy confirmed the sale after the Almanack broke the story. Its news release linked to a video of Boreas Ponds. The conservancy’s website also offers breathtaking photos of Boreas Ponds. The Nature Conservancy bought all 161,000 acres of the Finch, Pruyn lands in 2007. It later sold 89,000 acres to a Danish pension fund. The state owns a conservation easement on these lands that permits logging but prohibits subdivision and development. 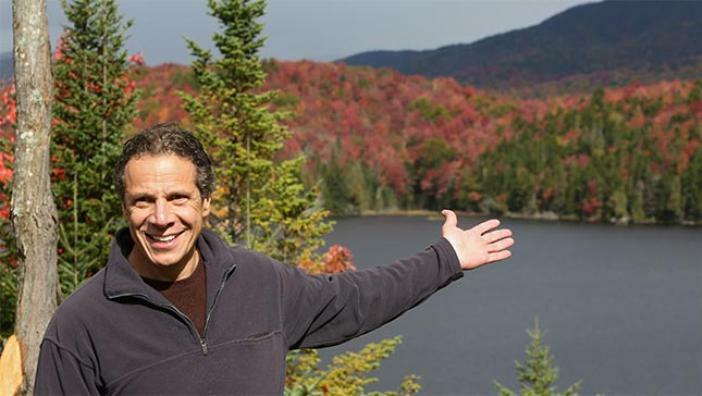 In 2012, Governor Andrew Cuomo announced that the state would purchase, in stages, 65,000 acres for the Forest Preserve, including the Essex Chain Lakes, OK Slip Falls, parts of the Hudson Gorge, and Boreas Ponds. The other properties have already been acquired. “We are grateful to Governor Cuomo and his team for recognizing that investing in nature is an investment in New York’s future. From providing cost-effective natural water filtration and carbon storage to bolstering the tourism economy, protecting these forests and waters is an investment that will produce very big returns. We look forward to continuing to work with the state and Adirondack communities,” said Mark Tercek, president and CEO of the Nature Conservancy. DEC and the Adirondack Park Agency now will have to decide how to manage and classify the Boreas Ponds Tract — decisions sure to be controversial. Environmentalists want most of the tract added to the High Peaks Wilderness, whereas local officials favor a Wild Forest classification. The main difference between Wilderness and Wild Forest is that motorized uses and bicycling are banned in Wilderness Areas. The Adirondack Council and Adirondack Mountain Club (ADK) are sponsoring a petition drive dubbed Be Wild NY to persuade the Cuomo administration to add to the High Peaks Wilderness not only the bulk of the Boreas Ponds Tract, but also the Dix Mountain Wilderness and some smaller parcels of former Finch, Pruyn lands. If this is done, the High Peaks Wilderness, already the largest Wilderness Area in the Adirondack Park, would grow to roughly 280,000 acres from 204,000 acres. But North Hudson Supervisor Ron Moore, whose town includes Boreas Ponds, told the Adirondack Explorer last fall that he wants the tract classified as Wild Forest to facilitate public access and maximize its recreational potential. For example, he wants people to be allowed to bicycle on old logging roads in the area. Willie Janeway, executive director of the Adirondack Council, maintains that the Wilderness classification will attract a variety of outdoor enthusiasts, including hikers, paddlers, snowshoers, and cross-country skiers, and boost the local economy. He added that the tract could serve as a new gateway to the popular High Peaks Wilderness. Controversy also has arisen over the status of Gulf Brook Road, a former logging road that leads to Boreas Ponds. Environmentalist groups agree that much of the road should be left open to allow the public to drive as far as LaBiere Flow, an impounded section of the Boreas River about a mile from Boreas Ponds. From there hikers could walk and canoeists could paddle and portage to the ponds. Some wilderness advocates, such as Bill Ingersoll, publisher of the Discover the Adirondacks guidebooks, maintain that the road should be closed. This would require people to hike about seven miles to get to the ponds. In contrast, Moore contends that the public should be able to drive beyond LaBiere Flow to within three-quarters of a mile of Boreas Ponds. The disabled, he said, should be able to drive to within a quarter-mile of the ponds. Gulf Brook Road also figures in a disagreement among environmentalists over where to draw the line between Wilderness and Wild Forest. Protect the Adirondacks contends that Gulf Brook Road is the logical boundary. Under this scenario, it would also serve as a snowmobile trail in winter connecting North Hudson and Newcomb. The council, ADK, and Adirondack Wild favor a plan that would extend the Wilderness boundary south of Gulf Brook almost to Blue Ridge Road, a major county highway. The snowmobile trail would then be cut between Blue Ridge Road and the Wilderness Area. The hitch with this plan is that Gulf Brook Road would then penetrate the Wilderness Area. In order to allow people to drive to LaBiere Flow, the road would be classified as a Primitive Corridor. Peter Bauer, executive director of Protect the Adirondacks, contends that creating a Primitive Corridor would weaken the protections for Wilderness in the Adirondack Park State Land Master Plan. “If we’re going to have a motorized road, it should be in a Wild Forest Area,” he told the Explorer last fall. He also said that using the road for the snowmobile trail would obviate the cutting of thousands of trees. Janeway counters that the Be Wild NY plan maximizes the amount of land to be classified as Wilderness and that state regulations would limit the number of trees cut for the snowmobile trail. Other issues are whether a lodge on the south shore of Boreas Ponds, built by Finch, Pruyn as a corporate retreat, should be removed and whether a concrete dam at the foot of the ponds should maintained.